Since 2002, the European Union has intervened abroad thirty times in three different continents. Not to be confused with List of diplomatic missions of the European Union. The European Union (EU) has undertaken a number of overseas missions and operations, drawing on civilian and military capabilities, in several countries across three continents (Europe, Africa and Asia), as part of its Common Security and Defence Policy (CSDP). The operation or mission in question will work in agreement and coordination with the EU delegations, until 2009 known as the European Security and Defence Policy (ESDP). In the EU terminology, civilian CSDP interventions are called ‘missions’, regardless of whether they have an executive mandate such as EULEX Kosovo or a non-executive mandate (all others). Military interventions, however, can either have an executive mandate such as for example Operation Atalanta in which case they are referred to as ‘operations’ and are commanded at two-star level; or non-executive mandate (e.g. EUTM Somalia) in which case they are called ‘missions’ and are commanded at one-star level. All CSDP missions and operations are given a prefix depending on the nature of the mission, which is either military or civilian. The operations are named as if the multinational force conducting it is established specifically for the unique operation, which is often the case. The force may however also consist of permanent multinational forces such as the European Corps. The decision to deploy - together with any subsequent management of - the mission or operation in question, will ultimately be taken by the EU member states in the Foreign Affairs Council (FAC). All civilian missions are directed by the Civilian Planning and Conduct Capability (CPCC), a directorate of the External Action Service (EEAS) in Brussels, Belgium. Military Planning and Conduct Capability (MPCC) of the EEAS' Military Staff (EUMS) in Brussels, Belgium, which may presently run only non-executive operations. By the end of 2020 the MPCC will also be capable of running executive operations of up to 2500 troops (i.e. the size of one battle group). Allied Command Operations (ACO) of the North Atlantic Treaty Organisation (NATO). ACO's main headquarters is the Supreme Headquarters Allied Powers Europe (SHAPE) in Mons, Belgium. This use of NATO assets by the EU, provided by the 'Berlin Plus agreement', is subject to a "right of first refusal", i.e. NATO must first decline to intervene in a given crisis, and contingent on unanimous approval among NATO states, including those outside of the EU. For example, Turkish reservations about Operation Concordia using NATO assets delayed its deployment by more than five months. An additional theoretical option for military operations is to activate a European Union Operations Centre (EU OPCEN), a non-standing, ad-hoc headquarters. The OPCEN was active between 2012 and 2016, and its structures will be integrated into the MPCC in 2020. Prior to the creation of the MPCC, the Local Mission Headquarters were be established in the country in which training missions (EUTM) took place. 31 March 2003 15 December 2003 European Union Military Operation in the Former Yugoslav Republic of Macedonia EUFOR Concordia Operation Concordia 400 ? 12 June 2003 1 September 2003 European Union Military Operation in the Democratic Republic of the Congo (2003) EUFOR Artemis Operation Artemis 1800 ? 12 June 2006 30 November 2006 European Union Military Operation in the Democratic Republic of the Congo (2006) EUFOR RD Congo N/A 2300 ? 17 March 2008 15 March 2009 European Union Military Operation in Chad and the Central African Republic EUFOR Tchad/RCA N/A 3700 ? 10 February 2014 23 March 2015 European Union Military Operation in the Central African Republic EUFOR RCA N/A 600 ? April 2014 — European Union Capacity Building Mission in Mali EUCAP Sahel Mali N/A ? ? July 2012 — European Union Capacity Building Mission in Niger EUCAP Sahel Niger N/A ? ? 16 July 2012 — European Union Regional Maritime Capacity Building for the Horn of Africa and the Western Indian Ocean[a] EUCAP Somalia EUCAP Nestor[b] ? ? March 2015 July 2016 European Union Military Advisory Mission in the Central African Republic EUMAM RCA N/A ? ? February 2013 January 2014 European Union Aviation Security Mission in South Sudan[c] EUAVSEC South Sudan N/A ? ? 9 December 2008 — European Union Rule of Law Mission in Kosovo EULEX Kosovo N/A ? ? 1 July 2005 31 December 2013 European Union Integrated Rule of Law Mission in Iraq EUJUST LEX Iraq N/A ? ? 12 February 2008 30 September 2010 European Union Mission in Support of Security Sector Reform in Guinea-Bissau[d] EUSSR Guinea-Bissau N/A ? ? 16 July 2004 14 July 2005 European Union Rule of Law Mission in Georgia[e] EUJUST Georgia EUJUST Themis 27 ? 8 June 2005 2016 European Union Security Sector Reform Mission in the Democratic Republic of the Congo[f] EUSEC RD Congo N/A ? ? 15 September 2005 15 December 2006 European Union Monitoring Mission in Aceh AMM N/A ? ? 1 October 2008 — European Union Monitoring Mission in Georgia EUMM Georgia N/A ? ? December 2014 — European Union Advisory Mission Ukraine EUAM Ukraine N/A ? ? 22 November 2017 — European Union Advisory Mission Iraq EUAM Iraq N/A ? ? 12 April 2005 30 June 2007 European Union Police Mission in Kinshasa[g] EUPOL Kinshasa N/A ? ? 1 July 2007 30 September 2014 European Union Police Mission in the Democratic Republic of the Congo[h] EUPOL RD Congo N/A ? ? 15 December 2003 14 December 2005 European Union Police Mission in the former Yugoslav Republic of Macedonia[i] EUPOL FYROM EUPOL Proxima 200 ? 1 January 2003 30 June 2012 European Union Police Mission in Bosnia and Herzegovina EUPM BiH N/A 774 ? 15 June 2007 31 December 2016 European Union Police Mission in Afghanistan EUPOL Afghanistan N/A ? ? 1 January 2006 — European Union Police Mission for the Palestinian Territories EUPOL COPPS N/A ? ? 1 December 2005 — European Union Border Assistance Mission to Moldova and Ukraine EUBAM Moldova and Ukraine N/A ? ? May 2013 — European Union Integrated Border Assistance Mission in Libya EUBAM Libya N/A ? ? 25 November 2005 — European Union Border Assistance Mission to Rafah EUBAM Rafah N/A ? ? 15 December 2005 14 June 2006 European Union Police Advisory Team in the former Yugoslav Republic of Macedonia[j] EUPAT N/A ? ? 18 July 2005 31 December 2007 European Union Support to African Union Mission in Sudan[k] AMIS EU Supporting Action N/A ? ? December 2002 — Police Assistance Mission of the European Community to Albania PAMECA N/A ? ? 1 April 2011: European Union Military Operation in Libya (EUFOR Libya): Proposed as a complement to NATO's aerial bombing campaign and no-fly zone in the Libyan Civil War. ^ A regional training mission aiming to strengthen the maritime capacities of eight countries in the Horn of Africa and the Western Indian Ocean. Since 2003, NATO has also operated its own counter-piracy mission off of the Horn of Africa as well. ^ Name of the mission prior to 1 March 2016. ^ Strengthening aviation security at Juba's airport. ^ A mission for security sector reform in Guinea-Bissau with an initial mandate until 31 May 2009. Ended due to concerns over cooperation by Guinea-Bissau. ^ This mission was launched on 16 July 2004 for a duration of 12 months, and was designed to support the Georgian authorities in challenges to the criminal justice system and reform process. ^ The European Union mission is to provide advice and assistance for security sector reform in the Democratic Republic of the Congo. Among EUSEC DR Congo's projects was the 'Modernisation de l’Administration des Forces Armées de la RDC' (Modernisation of the Administration of the FARDC) underway in December 2008, under which, amongst other projects, information technology training was being delivered. It appears that in December 2009, Secretary-General/High Representative Javier Solana issued a formal invitation for the United States government to offer a contribution to EUSEC RD Congo. EUSEC DR Congo was initially planned in 2005-06 to include eight EU advisors assigned to posts in the DRC's integrated military structure (Structure Militaire d'Integration (? )), the army general staff, the National Committee for Disarmament, Demobilization, and Reintegration (CONADER? ), the Joint Operational Committee, and the Ministry of Defence. From 2007 to 2011 EUSEC personnel grew from 8 to 46, with about 30 locally employed staff. 34 locally employed staff were listed in 2011. In 2008 with 46 staff 26 were in Kinshasa and 20 in the eastern DRC. Two personnel have died due to illness. ^ In October 2003, the Democratic Republic of Congo requested the EU for assistance in setting up an Integrated Police Unit. EUPOL Kinshasa monitored, mentored and advised the IPU once trained and operational under a Congolese chain of command, until the national elections in DRC held in 2005. The mission finished on 30 June 2007. ^ Established as a successor to EUPOL Kinshasa with an initial mandate until 30 June 2008. ^ This operation was launched on 15 December 2003 and covered an initial period of one year. ^ Launched on 15 December 2005 as a follow-on mission to EUPOL Proxima. The EU monitors and mentors the country's police on priority issues in the field of border police, public peace and order and accountability, the fight against corruption and organised crime. It finished its mandate in May 2006. ^ European Union support for the African Union Mission in Sudan (AMIS), the mission of the African Union in Darfur. NATO likewise provided support to AMIS from 2005 to 2007 Both EU and NATO missions ended with the handover to UNAMID on 31 December 2007. It included provision of airlift for 2,000 personnel, financial aid totalling more than EUR 500 million, the deployment of 15 military experts, 30 police officers, two military observers with AMIS, plus several military advisors sent to Addis Ababa to support the EU Special Representative. ^ Benjamin Pohl (2013) The logic underpinning EU crisis management operations, European Security, 22(3): 307-325, DOI:10.1080/09662839.2012.726220, p. 311. ^ "The EU Military Staff: A frog in boiling water?". 2017-08-10. ^ "EUCAP Nestor renamed as EUCAP Somalia – New website - EUCAP Somalia". Eucap-som.eu. March 2017. Retrieved 2018-07-24. ^ "EU to end Guinea-Bissau security mission". BBC News. 2 August 2010. ^ Sharon Wiharta, 'Peacebuilding: the new international focus on Africa,' SIPRI Yearbook 2006, Oxford University Press, p.154. ^ Brookes Tigner, JDW 9 January 2008. 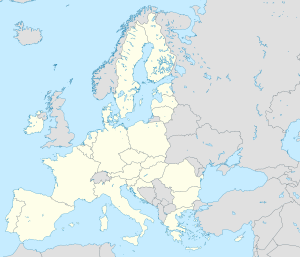 Wikimedia Commons has media related to Military operations involving the European Union.